In this technological era, mobile device are updated from time to time. Are you planning to replace your old phone with a new one? So how will you deal with the old device? Quite a few users will choose to sell their old Android phone so as to gain some extra money! But before selling your old Android phone, there is something more important that should be done within simple clicks. That is: permanently erase Android data before selling it. This article shares you with two methods to wipe Android phone data. Factory reset is a built-in feature of the Android device that erases all data on your Android phone or tablet and restores them to their factory state. 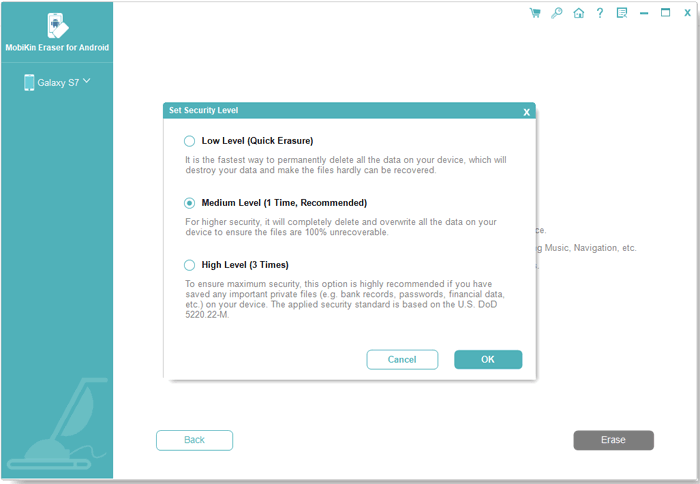 Many users choose to reset their devices to factory settings to protect their phone data from being leaked when they are facing a phone freeze, running slow or planning to sell or donate this device. Before restoring the phone to factory settings, we recommend that you back up your Android data, remove the SIM card and microSD card, and log out of all service accounts. Step 1. Turn on your Android phone and go to the "Settings" app. Step 2. Click on the Backup and reset. Step 3. Find and tap the option of "Factory data reset" and then click "Reset phone" to confirm the process. Warning: Factory Reset isn't enough for wiping Your Android Phone! This factory resetting process may take about 2-5 minutes. After it completed, the operating system will restart and perform in a clean state. However, according to a recent report from security companies, the factory reset is not enough to completely erase all data on all Android devices. To test the reliability of the factory settings, Avast purchased 20 used Android phones on eBay and successfully recovered old emails, texts, and even photos from these phones without much effort. Therefore, the factory reset is not enough to completely erase Android phones and tablets. In fact, the data you delete via factory reset is still stored on the device, and unless they are overwritten by new data, they can be easily recovered by some data recovery tools in the software market. Don't worry, below we will provide a better alternative way to help you permanently erase Android data without worrying about any recovery possibility. If you feel unsecured about the way above, you will need a professional data erase tool like this Android Data Eraser software at hand. It is a powerful data erasing program designed for Android users to wipe their Android phone permanently. 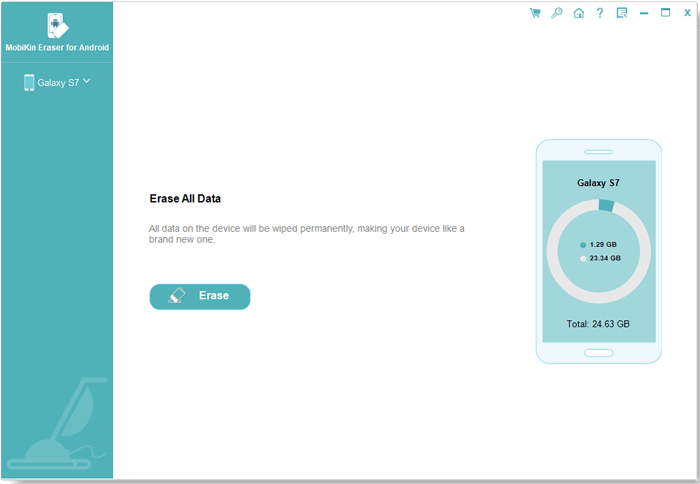 With this software, you can easily erase Android data before selling it, including contacts, messages, photos, videos, movies, apps and many more. And files deleted with this software will have no chance of being recovered. Best of all, various brands of Android devices can be perfectly supported by this almighty program, including Samsung, Motorola, Sony, HTC, LG and many more. This software totally frees yourself from troubles of privacy leak due to possible data recovery from the deleted data by some people with bad ideas! > Hassle-free and click-through process. > Clean up photos, contacts, text messages, call logs and other private data with simple clicks. > Supports almost all Android devices available in the market. Also, it only needs a few steps to complete its process. Below are the simple steps of using Android Data Eraser to erase Android data! You can actually download the right version to give it a try by yourself now! Step 1. Make sure to download the right version of the software and then open the installed software on the computer. After that, get your Android phone connected to the computer via the USB cord. And install the MobileGo connector on your device as asked. Step 2. Now, choose the mode of Erase All Data to continue the process. Step 3. After that, type "delete" on the box to confirm your action and then hit the Erase option to erase Android data before selling it. Finally, just wait patiently for the process to get completed within a little while. After erasing your Android phone data by the Android Data Eraser, there is no chance to recover back the erased data any more. After testing, Android Data Eraser is really a must-have and reliable tool for wipe out Android for selling if you change your Android device frequently.